I have learnt that there is a very clear distinction between food bloggers and food photographers / stylists. I am a food blogger and I concentrate on bringing you, my reader, the very best recipes I possibly can. I cook at night when I get home from work – yes, I do have a regular job. I usually start cooking at 18h00 and in summer it is still light, but in winter, the sun has set and it is a lights on situation. I dish up our supper around 19h00 and just before we go and sit down I take a photograph of our meal. Basically, what you see here is what we eat. On the very odd occasion I will take a photo during the day but that is about as close to food photography as I will get. This photograph is the bouillabaisse I made at home and photographed under a halogen light in my kitchen. I was very fortunate to spend an afternoon with Sam Linsell who is a food stylist / photographer. I made bouillabaisse for her and she showed me a few tricks of her trade. Sam showed me how she goes about styling her photographs and what goes in to taking the perfect shot. I learnt so much from her, and even though you don’t see it everyday on my blog it is something I think about each time I take a photo. I know that the next step for me is a better camera -but that is a long way off from happening as I am throwing all my spare cash at building a house, and I want to stay true to being a food blogger first and foremost. This photograph was taken by me and styled by Sam. I don’t make use of props as I am a bit impatient and I like to concentrate on the dish. Also, my blog is not photo ‘heavy’ as I am really all about the recipe. 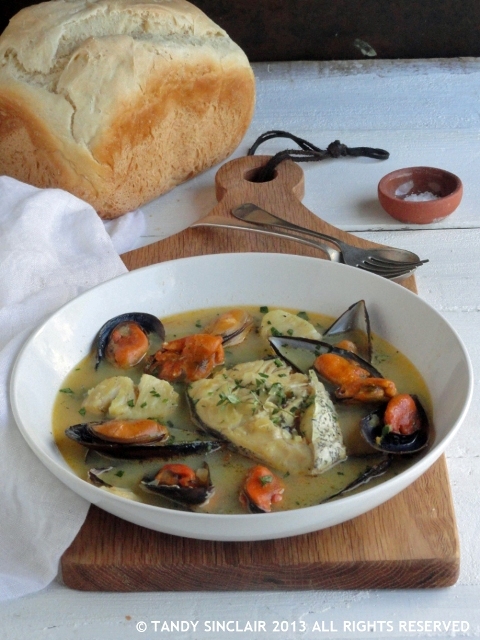 This recipe for bouillabaisse was tested over a long period of time and made about 4 times before I was happy with the end result. I hope you will give it a try! I need to try working on my photo-taking skills as well, but just like you I want to first focus on the food itself and I am also investing my money towards renovations in my new home. Love your admissions on food styling Tandy! I’m with you although your recipes are so much more eloquent. I especially like this one as I am a shell fish eater. Always appreciate your food and your photos. I love to see your process. The difference between the two photos is interesting. And looks tasty! Thank you Mary Frances – the styling takes a lot of time! I don’t go too crazy with food styling but I do try to put out a placement and have some items in the background just for some context. it’s just a few extra steps but it really makes a photo much better! 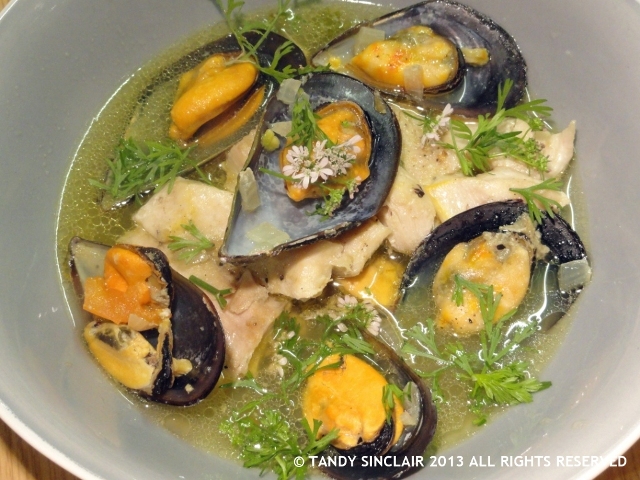 Hi, Tandy, lovely bouillabaisse recipe and I like the idea of adding some coriander leaves and blossoms to it. Like you I am a WYSIWIT (what-you-see-is-what-I-took) person and most of the time I use my iPhone camera app. But it is nice when time allows it to fiddle around a little bit with a better camera and the results are obvious. LOL, with you whole heartedly! Fabulous recipe Tandy. I like to photograph the food and not props. It might be a bit short sighted but I like to show the food the way it will be eaten and not dressed up, if you know what I mean. Your photographs are lovely. Oh Tandy, I hear you!! I too work and have to make do with artificial lighting, take a quick pick a minute before it’s devoured by the family…I love Bouillabaisse. It reminds me of the month I spent in Marseille, we dined on this when we felt like something special and it was always washed down with a crispy glass of white. Bliss! Oh, how lovely to spend a month in Marseille. I have never been there but it is on my list of places to go!